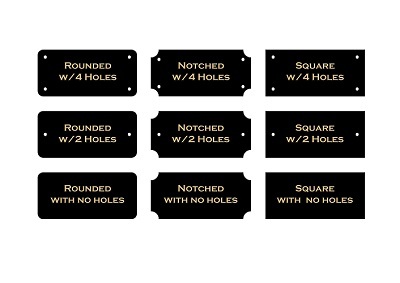 These solid brass engraving plates are designed to be laser engraved showing a brilliant gold color engraving. These are made from high quality material designed for engraving and will have a finish that uniform, smooth, and blemish-free. All of our engraving plates are guaranteed to be manufactured as the ‘best available’ in the industry and you will receive the highest quality that is proudly made in the USA. Solid Brass Made In The USA. Material thickness; black on brass plated steel is .38mm / .015". Black on brass plated steel plates will display engraved letters in a gold/brass color.